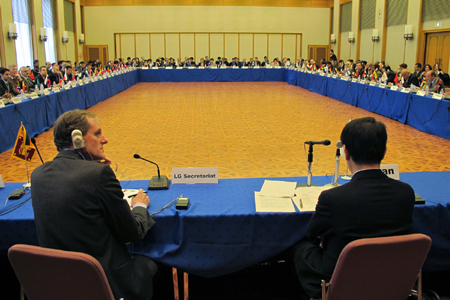 - "Innovative financing : it is now time for action"
The Presidency of Japan hosted the 8th plenary session of the Leading Group in Tokyo on 16 and 17 December. Over 180 participants, including several ministers of member countries, many international organizations, foundations and NGOs have participated. Sri Lanka, Ecuador and Bhutan joined the Group, gathering now 63 countries. The session confirmed the change of scale of innovative financing mechanisms. States, IOs, NGOs and private sector exchanged views on these matters. The Leading Group wishes the G20 to focus more on innovative financing in its "development" agenda and pledged to conduct several technical studies. A new working group on "health" was also established. The Leading Group will convene a side-event on the sidelines of the Summit on Least Developed Countries (LDCs) in Istanbul next May, in order to promote the potential of innovative financing for LDCs. During the session, the Presidency was given by the Japanese Minister of Foreign Affairs, Mr. Seiji Maehara, to his Malian counterpart, Moctar Ouane, for the first half of 2011. Spain will take over the presidency during the second half of 2011.